Ebony G. Patterson’s new exhibition “…while the dew is still on the roses…” is wonderfully deceptive. 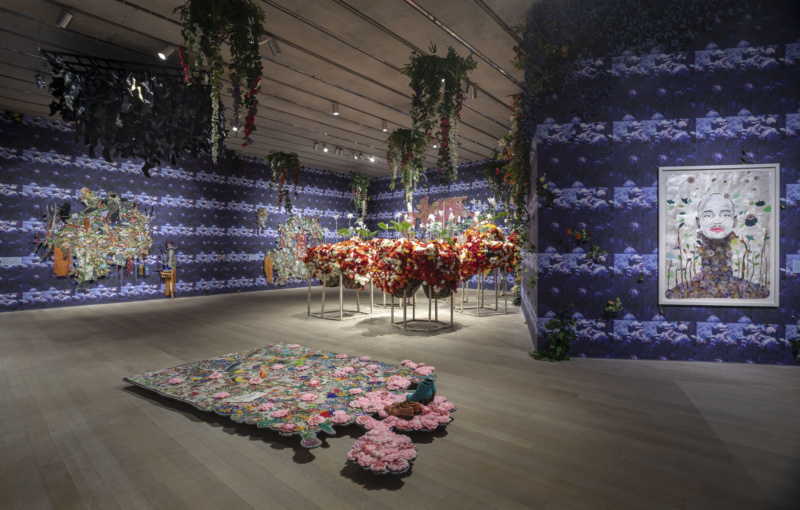 Opening at Art Basel Miami and housed in the Pérez Art Museum in conjunction with Christian Louboutin, Patterson created a beautiful nocturnal garden embellished with polychromatic flowers that served as the backdrop for 13 large-scale works, six of which have never been seen before. True to her aesthetic, the pieces are deeply ornate, through paintings, videos, drawings and tapestries that lure the viewer in. Patterson says, “there’s a sense of discovery every time I’m making something, even if it’s materials that I’ve worked with before. There’s more activity and action between the layers.” Just beneath the surface, complex ideas are woven into the work creating a socio-political “Where’s Waldo,” where the observer can find themes around race, loss, gender, and class that are alive in today’s larger cultural narrative. Throughout Patterson’s body of work, she has used gardens as fertile ground to explore complex concepts. “For almost five years, I have been exploring the idea of gardens, both real and imagined, and their relationship to postcolonial spaces. “I am interested in how gardens—natural but cultivated settings—operate with social demarcations. I investigate their relationship to beauty, dress, class, race, the body, land, and death,” she says. For Patterson, the garden represents coming from the earth, living, and then once again returning to the earth. The title of her latest exhibition is from a funerary hymn, “In the Garden,” by C. Austin Miles. In it she says she found references to mourning, renewal, and a sense of urgency for the possibility of change. The garden has also been a catalyst for exploring contrasting ideas. In her most recent garden, she addresses visibility and invisibility, masculinity and femininity, life and death, and dress as a symbol of dignity. 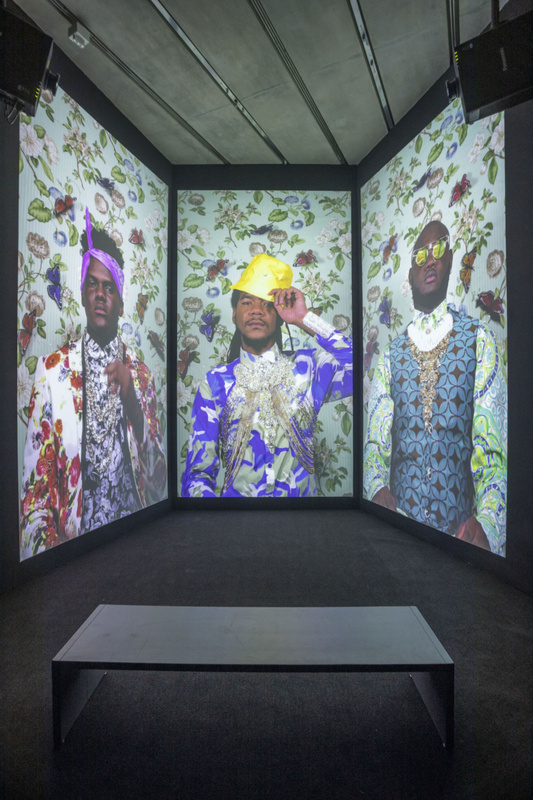 One of the standout pieces in this latest exhibition is …three kings weep…, an eight-minute video featuring three young black men each on a screen de-robing out of elaborate clothes and jewelry; the video inconspicuously plays backward. Over the visual, a male voice recites Claude McKay’s 1919 poem, “If We Must Die.” Patterson makes a bold commentary on how dress affects and perhaps distorts the perception and visibility of black bodies making them susceptible to abuse and death. Patterson is masterful in coating difficult and perhaps even disturbing realities in beauty. “…while the dew is still on the roses…” pushes against deeply rooted, antiquated narratives. Patterson is creating a new visual language that in turn can lead to a greater, more expansive narrative. Her show requires the spectator to engage in an immersive way. The work buries itself in the viewer and is a reminder of our collective humanity that so easily gets lost in the politics of daily life.